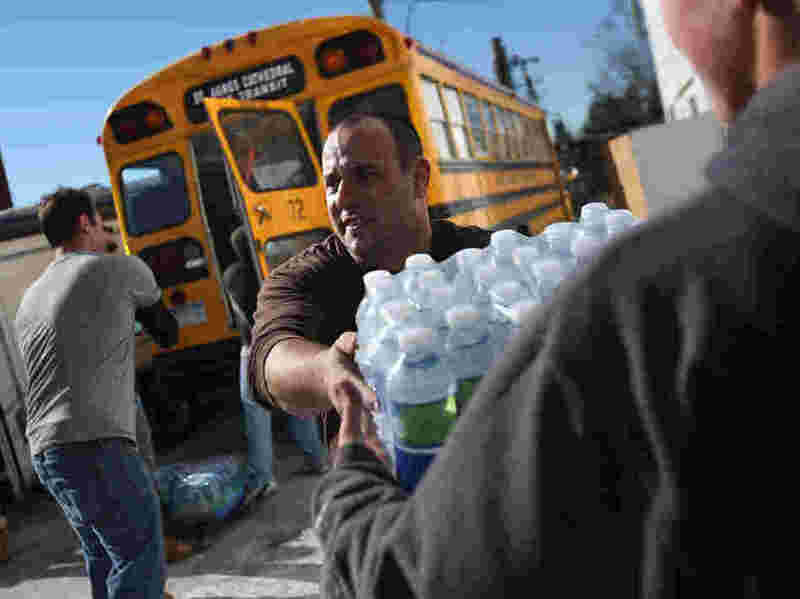 Long Beach, N.Y.: Volunteers unloaded water at an aid distribution center on Sunday. NPR librarians continue to help us keep track of the recovery from Superstorm Sandy and the deadly toll from the storm that blasted New Jersey, New York City and other parts of the Mid-Atlantic, Northeast and New England one week ago. â" Number of deaths: At least 115 in the U.S., by NPR's count. The Associated Press reports there were at least 106 fatalities. There were 69 Sandy-related deaths in the Caribbean and two in Canada. â" Power outages: 1,374,676 customers still didn't have electricity as of this morning, according to the Department of Energy. Most were in New Jersey (779,779) and New York State (487,952). How To Help: Also today, our colleagues at WNYC continue to host a "how to help" post that has lot of information about what groups are doing in and around New York City and where to get in touch with those organizations. If you're looking for how to help out in New Jersey, The Star-Ledger has a "post-Sandy survival guide" with details about groups and organizations that are assisting those who were in harm's way in the Garden State.